In 2011 livestock consumed nearly 29.9 billion pounds of antibiotics. To put it another way, the livestock industry is now consuming nearly four-fifths of the antibiotics used in the US. I am moving to Raleigh, North Carolina in 9 days so I have been trying to eat up food that I already have on hand. Now most recipes I came across for acorn squash included brown sugar or syrup to make it more of a sweet dish. I went a different route with garlic, rosemary, and onions. You could definitely add some other vegetables to this recipe, just throw in whatever vegetables you have on hand! 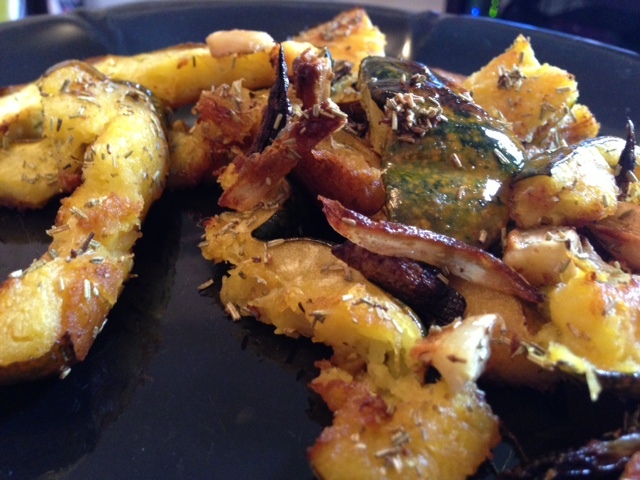 Plus, roasted veggies are good cold as leftovers! Cut the squash in half and scoop out the seeds and the stringy parts. Cut the ends of the squash off. Slice the squash into pieces about 1/2 inch thick. 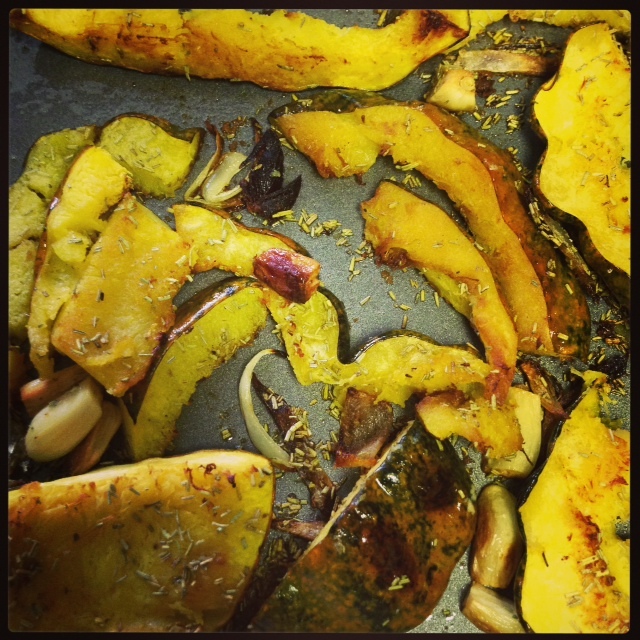 Put the pieces of squash in the pan with the cloves of garlic and slices of onion. Add pieces of fresh rosemary or sprinkle rosemary liberally across the vegetables. Spread pieces of butter across the pan. Cook in the oven for about 30-40 minutes flipping the pieces of squash over half way through. Haha yeah mine sat on the counter for about two weeks before I got around to figuring out how I was going to cook it. I’ve ate acorn squash growing up, but this was my first time making it on my own. It turned out really yummy! Thanks for the comment!